Vauxhall/Opel has published a teaser image of the new Corsa, which launches later this year in its first-ever electric guise. The fifth-generation of the supermini will not only migrate over to PSA’s ‘Common Modular Platform’ (CMP) platform also being used for the new DS3 Crossback, but will also debut a battery-electric version, as announced more than a year ago, post-PSA takeover in Vauxhall turnaround plans. The electric Corsa is one of four Vauxhall/Opel ‘electrified’ models due on the market by 2020, also including the Grandland X PHEV, as the brand draws upon PSA’s electric drivetrains. No engine details have been announced yet but the line-up will also get internal combustion engine variants. 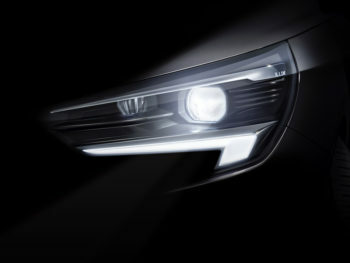 The teaser also reveals the car’s IntelliLux LED headlights. Previously seen on Astra and Insignia and billed as a segment first for a supermini, these automatically and continuously adapt the illuminated area in line with traffic conditions to ensure other drivers aren’t dazzled.